CHARLIE ROSE wasn't sure he'd heard right. National Security Advisor Susan Rice, his guest on PBS, was lamenting that the controversy over Israeli Prime Minister Benjamin Netanyahu's forthcoming speech to Congress had "injected a degree of partisanship" into the traditionally bipartisan US-Israel relationship. That's not only "unfortunate," said Rice. "It's destructive of the fabric of the relationship." Rose seemed nonplussed. "It's destructive of the fabric of the relationship?" The national security advisor dug in. "It's always been bipartisan. We need to keep it that way.... And when it becomes injected or infused with politics, that's a problem." 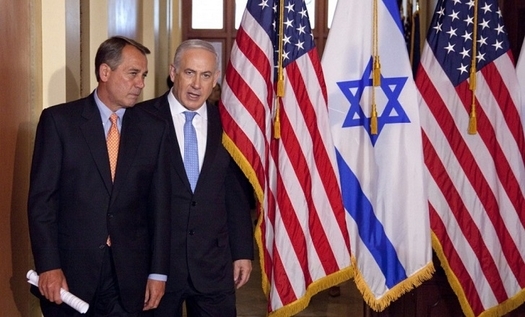 Israeli Prime Minister Benjamin Netanyahu, shown here with House Speaker John Boehner, is scheduled to speak to a joint meeting of Congress on Tuesday. He and Winston Churchill are the only foreign leaders ever invited to address Congress on three occasions. Well, yes: Netanyahu's planned March 3 speech has certainly become "infused with politics." Around 30 Democrats, encouraged by the White House, intend to skip the joint session in a show of pique over the supposed affront to President Obama, who is offended that the Israeli leader accepted House Speaker John Boehner's invitation to address Congress on the nuclear talks with Iran. Reasonable people can debate whether Netanyahu is really guilty of a breach of protocol in not seeking Obama's approval first — or if that is merely a pretext for a president who has long detested Netanyahu, a gifted communicator whose Churchillian warnings about the Iranian threat the administration wants to undercut. The day before Rice's appearance on "Charlie Rose," Gallup released its newest survey of American attitudes toward Israel. Despite weeks of clamor over Netanyahu's visit and the litany of White House complaints about Israeli policies toward the Palestinians, 70 percent of Americans have a favorable opinion of the Jewish state — virtually indistinguishable from the 72 percent favorability Gallup measured last year. When asked to choose sides in the regional conflict, public backing for Israel was unchanged at 62 percent, close to its all-time high. The administration's unvarnished hostility for Netanyahu may persuade a narrow slice of the Democratic caucus to boycott Tuesday's speech. And with Obama and Vice President Biden pointedly refusing to see Netanyahu when he comes to Washington — ostensibly to avoid influencing Israel's impending elections — perhaps there won't be quite as many rapturous ovations when the prime minister addresses Congress as there were when he last mounted the House rostrum in 2011. It's safe to assume, however, that the vast majority of the 114th Congress will be on hand to hear Netanyahu's message, and that avid viewers nationwide — make that worldwide — will be paying close attention as well. Indeed, by reacting so poisonously to Netanyahu's scheduled appearance, the White House has only fueled more interest in what he has to say. Obama may have guaranteed that Israel's leader will give the speech of his career to a once-in-a-lifetime audience. Asked where their sympathies lie in the Middle East, Americans consistently and overwhelmingly say: with Israel. The latest Gallup poll confirms a longstanding trend. Only at a superficial level is this about partisan or political loyalties. Immensely more important is the lethal threat of a nuclear-armed Iran. Even without the bomb, Iran is the world's most dangerous regime — apocalyptic incubator of terrorism and jihad, ruthless suppressor of human rights, unflagging zealot for wiping Israel "off the map," and fanatic about bringing "Death to America." Like any democratic politician, Netanyahu can be maddening or fickle. But there is no issue on which he has been so consistent, for so long, as preventing Tehran from acquiring the nuclear capability that would empower it to fulfill its genocidal goals. The fuss over protocol and personalities is interesting. It won't keep Americans from giving their ally's leader a respectful hearing. Tension between Israeli prime ministers and US presidents is nothing new. As Egypt and Syria massed for war against Israel in 1967, President Lyndon Johnson sharply warned Israel's Levi Eshkol not to launch a pre-emptive attack. Eshkol defied LBJ, and victory in the Six Day War was the result. In 1981, Menachem Begin's unilateral decision to destroy the Iraqi nuclear reactor at Osirak infuriated the Reagan administration, which voted to condemn Israel in the UN, and suspended the delivery of jet fighters as a mark of displeasure. Pressure from the White House has always been part of the US-Israel relationship. But so has the powerful, almost instinctive, bond between the American people and Israel. Obama won't be president after January 2017. Netanyahu's tenure as PM may end in a few weeks. But the ties that so uniquely bind the United States and the Jewish state remain. Maybe something, someday, will prove "destructive" to the "fabric" of that relationship. The squabble over Bibi's speech? Not a chance.